Wavelength dependencies of the object assemblies (a) optical extinction, (b) PEEM. The reduction below the wavelength of light of the size of a metallic object induces important modifications of its response to an optical excitation. One of the most dramatic effects is the emergence of collective electron oscillations modes, known as localized plasmons. For noble metals, these resonances are in the visible or near-infrared range of the spectrum. Plasmon resonances allow for the confinement of optical fields over lengths below the diffraction limit and thus yield strong local enhancements in terms of local electromagnetic fields (classical view) or density of electromagnetic modes (quantum view). The resulting Purcell effects play essential roles in the interaction of molecules with electromagnetic fields, of particular importance in our studies of STM-tip induced luminescence or tip-induced non-linear optical processes (see the corresponding sections). We have investigated plasmonic effects occurring in specifically designed metallic nano-object and realized by electron beam lithography (EBL). The determination of the spatial distribution of the optical near field at object resonances is commonly addressed by scanning near field optical microscopy (SNOM). While offering a field mapping at lateral resolution down to tens of nanometers, the measurement proceeds by the insertion of a probe in the immediate vicinity of the object, making its intrinsic optical characterization complex due to possibly strong tip / object coupling. As an alternative probing tool, we use photoemission electron microscopy (PEEM) in the multiphoton regime. By collecting the electrons emitted by metal nanoobjects under illumination, two-dimensional intensity maps reflecting the distribution of the optical near-field can be obtained. The imaging technique exploits well established electron optics, i.e. involves no physical probe altering the measure. In that way, optical phenomena are observed with a lateral resolution close to 50 nm. In a first step, we demonstrate the usefulness of the PEEM in plasmonics through comparisons between electron emission and classic integrated optical methods, i.e. extinction spectroscopy. A set of square arrays of disk-shaped Au disks exhibiting 7 different diameters D covering the 120-180 nm range in steps of 10 nm is studied. Samples were characterized by PEEM and extinction spectroscopy under normal incidence. Two main conclusions arise from the comparison of the spectral curves. First, both extinction and PEEM data exhibit resonance peaks at frequencies in the infrared part of the spectrum covering the 800-900 nm range. Second, for both techniques, the resonance peaks shift to the red as the diameter of the disk increases, consistently with a plasmonic origin (fig. 1). 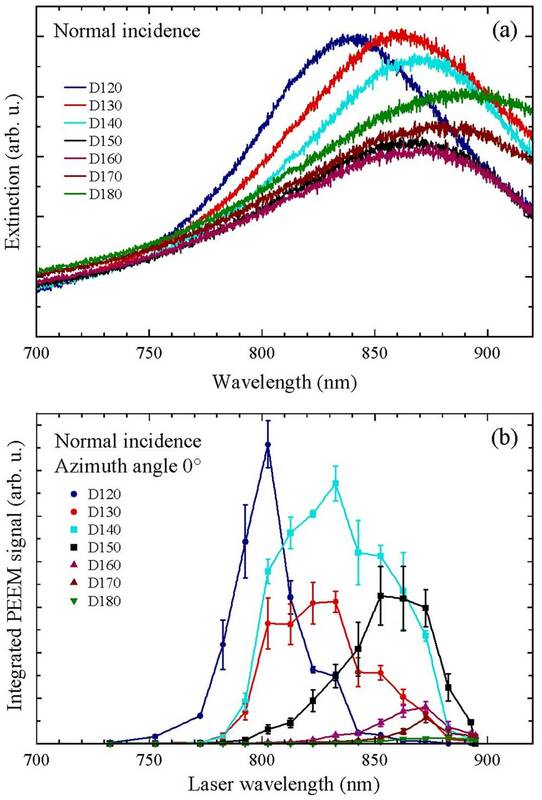 These spectral evidences validate the link between the localized surface plasmon excitation of a metal nanoparticle and its electron emission counterpart as measured by PEEM. A PEEM microscope offers the unique possibility to work at the single object scale. By varying the object shape, size and / or pattern geometry a vast array of plasmonic phenomena can be addressed (particle resonance, coupling…). This original approach is expected to contribute to the progresses in plasmonics, and to promote the nanoscale control of the interaction of molecules with optical fields.